I do not know a single person who is not busy. We all are. What makes us busier is kids. School schedules, work schedules, life schedules and more collide to take our time away and leave not much behind. But as moms, we need a moment away. For many of us, our only real break is bedtime. We need more. Like a pretty table and pretty plates with a delicate sandwich and a refreshing glass of iced tea to wash it all down. And cupcakes. We need cupcakes. Taking the time to create a Mommy Time Out Tea party for just you or you and other moms who also need a special thank you has to be easy. The last thing we want to do is spend all day prepping. 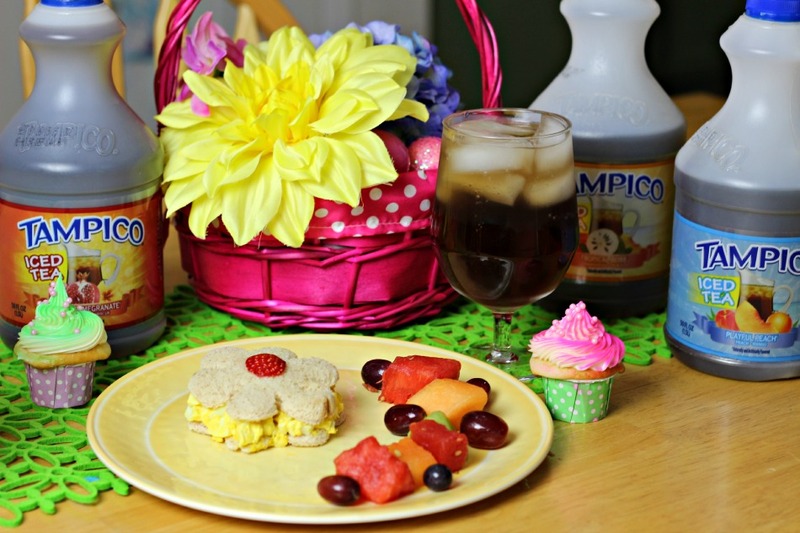 Simple sandwiches, some fun cookie cutters and some already prepared foods, like NEW Tampico Iced Teas, are all you need! I made egg salad sandwiches because I always have hard boiled eggs on hand. Add to that Easter just passing and half my work is done for me! I use a large flower shaped cookie cutter to make the bread. I added my egg salad and then created my sandwich. To make it more festive I used a strawberry! Serving it with a side of precut fruit that I purchased made it an easy, fun and pretty snack for my party. As an iced tea addict, and to compliment the sandwich and fruit, I poured my Tampico Iced Tea – the Playful Peach variety – into a glass. Buying it already made gives me flavors I would not make at home, like Tropical Bliss and Poppin’ Pomegranate, and takes away the work of steeping tea to perfection in my home. Which will never happen, mind you. The refreshing drink is necessary for a beautiful and relaxing Mommy Time Out Tea Party! Or anytime, as I sip a glass as I type. The last thing to add were some super pretty mini-cupcakes. I found some colorful mini-cup liners at the store and made a white cake with white icing. I then added some food color spray to give them a pretty look! Topping them with pink pearls sprinkles makes these an elegant addition to my table and my meal. The day I sat down and made myself and my neighbor take a Mommy Time Out Tea party was a rainy one. But with refreshing tea, fun sandwiches and a mini cupcake to boot, we felt like we really were spoiled even on just on a regular day.